The skin is the largest organ in the human body, as human beings age the skin integrity is lost. Platelet rich plasma therapy is a slow anti-aging approach which maintains functional integrity, prevents diseases and engages the body’s ability to renew, repair and regenerate. Platelet rich plasma (PRP) treatment has successfully been used by athletes to heal sports injuries and it is quickly becoming the preferred treatment option by many to rejuvenate their skin and reduce wrinkles, scars, and sun burns. Platelet rich plasma skin therapy, also known as Plasma Rich in Growth Factors (PRGF), Platelet Concentrate (PC), and Platelet Gel, is an intensified concentration of platelets suspended in scanty plasma amounts. In layman’s language, it is blood plasma which is rich in platelets, whereas being concentrated means the blood used has been obtained from the patient’s own body. This treatment has growth factors that fuel the healing of soft tissue (a tissue that supports and connects other body organs and structures). Human blood mainly contains red blood cells (93%), white blood cells (1%) and platelets (6%) and all of them are suspended in plasma. However, during platelet rich plasma skin therapy, the red blood cell count is reduced to 5%, that of platelets is raised to 94% while the white blood cells counts remain constant. 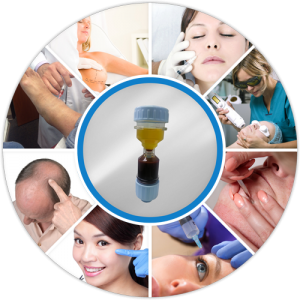 PRP therapy is a very simple and safe procedure where blood is taken from the patient just like a regular blood test, and the amount extracted depends on the number of regions you want to be corrected; usually, this ranges between 10-30 ml. Then the blood is put into a centrifugal machine for 8 to 10 minutes and spun in. This facilitates the separation of blood and then the platelet rich plasma is collected and injected into the desired area. At our medical centre we are offering PRP treatment in Bangkok, Thailand. Treatments bookings can be requested by completing the contact us form available by clicking here. Platelet rich plasma therapy can be done in an area that requires texture improvement and almost every person can benefit from it. Most patients will experience mild to moderate swelling in the treatment area, redness, and heat; this is because fluid volume has been administered hence swelling is unavoidable. Bruising can also occur and may take a few days to disappear. The physician typically ices the patient´s face immediately after the therapy to reduce swelling, bruising and skin irritation at the injection region. People with sensitive skin should take extra precaution as advised by the doctor. This includes allowing adequate interims so that the skin can heal itself, and minimizing the number of procedures done so close together. How soon are results realized? After a typical 4-6-week treatment interval, the very first thing patients see is enhanced skin elasticity and turgor. The results (collagen production) can take up to 3 months to manifest and the outcome varies from case to case. Since the implanted products come from the patient, chances of infections and chemical allergies are very little but factors like diseases, stress or smoking may affect the outcome. ¿Who is eligible for PRP therapy? Just like many cosmetic procedures, expectant mothers, those breastfeeding or trying to conceive, are not perfect candidates. This therapy is also not recommended in persons with autoimmune diseases, on anticoagulation management, previous cancer patients or those with implantation in the damaged area. The medical team at StemCells21 will assess each patient in deciding the best course of action and suitability for PRP therapy. Many types of fillers out there such as botox are made of solid materials that seal lines, skin creases and wrinkles including those around the mouth and lips area. This type of treatments last from six to eighteen months and therefore recurrent treatments are needed to fill the desired area again. Platelet rich plasma therapy on the other hand, stimulates one’s own collagen to grow for full rejuvenation; it is used to add volumes to faces that are beginning to sag, soften under eye area, boost the skin tone, tightness and texture, and finally fill in areas where fillers cannot spread and are risky to use. According to recent studies, 22 women participated in a study that integrated platelet rich plasma with three fractional laser treatments to survey skin rejuvenation impacts. 11 women were administered 3 fractional laser treatment alongside PRP, whereas the other eleven just received the 3 fractional laser treatments. This study was issued by the American Society for Dermatologic Surgery. The subjects were examined before they received the treatment, and thirty days after the procedure using assessments such as blind clinical evaluation and skin biopsies. It was reported that skin improvement was much better with platelet rich plasma skin therapy compared to fractional laser only. Would you like Treatment for Platelet Rich Plasma?